Ever since the Chromebook was introduced to the world in June of 2011, there has been a lot of confusion about what exactly Chrome OS does and what kind of apps it can run. To me it seemed fairly straight forward. The device is called a CHROMEbook, it runs CHROME OS, so naturally you would find apps in the CHROME Web Store. But, despite these obvious clues many people over the years have tried downloading and installing Android apps from the Google Play Store and then wonder why they don’t work. Many people have openly admitted that they know the difference between a Chrome app and an Android app, but they just assumed that Chromebooks would run Android apps because, you know. Google. Until fairly recently, this has not been true. Chromebooks did not support Android apps. But then, not long ago Google ported over a small handful of Android apps to Chromebooks using a tool called the App Runtime for Chrome (or the ARC Welder). And because Google sometimes likes to make really horrible decisions, this tool has been available to the public. The success rate of the ARC Welder (when used by amateurs) is not great, for a number of reasons, not the least of which is the fact that many apps require Google Play Services in order to function, which means they will not function on a Chromebook even with the ARC Welder. This means you aren’t able to use ARC to get any of Google’s apps like Gmail to work on your Chromebook. After that first handful of apps was ported over, we all kind of assumed that Google would slowly work with developers to bring more apps to Chromebooks, and that developers would take it upon themselves to use ARC to get their apps working on Chromebooks. This was not the case. Using ARC to port an Android app to Chrome OS still took work. It wasn’t really any better of a solution than just writing a separate Chrome OS app. In addition to the Google Play Services issue, ARC also didn’t pass Google’s own Android Compatibility Test Suite (CTS), and making it CTS compliant would have taken a lot of work. So, at the 2016 Google I/O Developer’s Conference, Google announced that they were bringing the entire Google Play Store to Chromebooks, and that they were doing it without ARC (read more about that here: Android on Chromebooks: Goodbye ARC, Hello Containers). It’s important to know that this new ARC-free implementation means that developers won’t actually have to do anything in order for their apps to work on Chromebooks, which is obviously ideal. Developers have enough on their plates as it is, expecting them to do a bunch of work just to make their apps work on Chromebooks is just asking for failure. Developers are encouraged to keep larger screen sizes in mind when developing apps, but any developer worth anything was already optimizing for larger, tablet-sized screens anyways so this shouldn’t be an issue. Also important is that you will now have two places to get apps for your Chromebook, the Chrome Web Store, as usual, and the Google Play Store. I mention this because those handful of apps that Google ported over using ARC were actually added to the Chrome Web Store. Many people downloading those apps didn’t even know they were actually Android apps. Now, there will be a clear separation. Chrome apps will be in the Chrome Web Store, and Android apps will be in the Google Play Store. If you own a device that supports the Google Play Store, (for a list, click here) then Android apps will automatically be enabled. 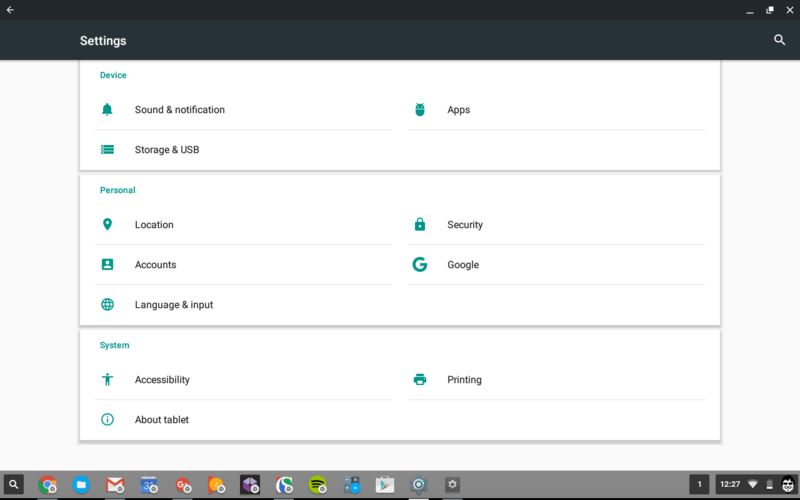 There is a setting in your regular Chrome settings that says “Enable Android apps to run on your Chromebook”. You’ll notice it’s checked. Feel free to un-check it if you wish to disable Android apps on your Chromebook. There’s also a link underneath that option that takes you to some typical Android settings that you’re probably already familiar with if you use an Android phone or tablet. You’ll also notice that in your shelf, is now a Google Play Store icon. This can be added/removed from the shelf like any other app. Adding apps works as you would expect. You open the Google Play Store, search for, and install an app. Just like you’ve always done on your Android phone or tablet. Android apps show up in the same place as all your regular Chrome apps . There’s no way to tell the difference between a Chrome app and it’s Android counterpart (example, the Google Drive Chrome app and the Google Drive Android app icons both look exactly the same). You just have to open one and see what happens. Android apps have minimize, maximize, and portrait/landscape toggle options. That’s about it. Go ahead, install some Android apps and tell us how it goes! May 19th 2016 – Google announces that the Google Play Store is coming to Chromebooks. July 14th 2016 – Chromebook Pixel (2015), Acer R11, and Asus Chromebook Flip (1st gen) have access to the Google Play Store (beta) in Developer mode. February 13th 2017 – Samsung Chromebook Plus goes on sale, with access to Google Play Store (beta) in Stable channel. April 25th 2017 – Chromium Project’s Android on Chrome OS page is finally updated, to include Samsung Chromebook Plus, AOpen Chromebase Mini and Chromebox Mini as having Google Play Store (beta) in the Stable channel, and Acer R13 and Asus Flip C302 in the Beta channel. May 28th 2017 – Samsung Chromebook Pro goes on sale with access to Google Play Store (beta) in the Stable channel. I love your site and the usefull information. This evening i try to install ubuntu on my chromebook acer 14 for work, hopefully it works. My question is, is there any date or rumor when my chromebook wil have the google play store. Is this still happening? I’ve got a Toshiba 2 Chromebook and access to Android apps would be very welcome. I have an Acer Chromebook 15. I love (or loved as of late) playing the Google Play download game of King of Avalon: Dragon Warfare. It has worked beautifully ever since I got the CB in October of 2017. Three weeks ago, when I clicked on the icon to start up the game, the mouse would move wherever I pointed it….but I can’t click on anything! My click went away! I called Acer and they said they couldn’t even help me. I can’t be the only CB user on the planet to have this happen to….am I? The mouse/touchpad will work as it should EVERYWHERE else perfectly. I have unsynced everything…uninstalled then reinstalled the game numerous time with the same outcome….no click! Only my beloved game is affected. What do I do? Any suggestions? I am trying to avoid doing a Powerwash. Is that my only option now??? I even emailed the makes of the game to see if it was a bug or something on their end….no response Any help would be greatly appreciated!! !